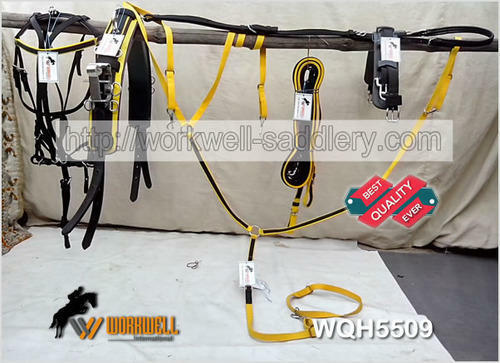 Excellent Quality Quick Hitch Trotting Harness, all Parts of the harness racing made with genuine material . Handcrafted with the Durable harness Nylon. Quick release system with stainless steel keepers. Forged stainless steel couplers. Stainless steel tree. Comes complete with QH racing saddle, girth, back strap with fixed crupper, head pole straps, martigale, lounge lines, open bridle and over check, chin strap.